Sarah Spencer White was born and raised in Greensboro, NC. She graduated Phi Beta Kappa from the University of North Carolina at Chapel Hill with a B.F.A. in Studio Art and a B.A. in English. White has been a working, exhibiting sculptor since receiving her M.F.A. in 1997 from the University of Colorado at Boulder where she studied with Scott Chamberlin, Betty Woodman and Antonette Rosato. Recent solo shows include Spill at Golden Belt Gallery 100, Durham NC and the Louise Brown Gallery at Duke University. Other solo shows include a 2001 exhibition at Pewabic Pottery (Detroit, MI) and 2001 and 2004 shows at the Durham Arts Guild. Her work was selected for the 1999 National Council for Education in the Ceramic Arts Clay National. Other significant group shows include The Other F Word at the University Fine Arts Gallery (Morris, MN), Organics at the Carbondale Clay Center (Carbondale, CO), Evocative Implements at Baltimore Clayworks Gallery (Baltimore, MD), Artists on Their Own at the Jane Hartsook Gallery (NYC), Constant Change at the Greenhill Center for North Carolina Art (Greensboro, NC). A 2003 article in Ceramic Art and Perception, a ceramics magazine published quarterly in Australia, details her sculptural work. 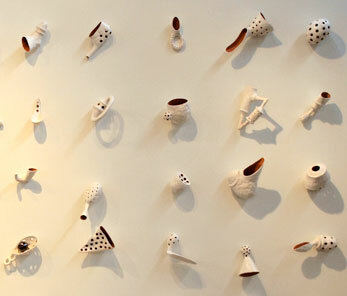 Other press includes “Under the Skin: the Ceramic Work of Sarah Spencer White” (Independent Weekly). She has been awarded grants from the Dorothy A. Brown Fund and the United Arts Council of North Carolina and a residency at Virginia Center for the Creative Arts. Sarah works and lives in Durham, NC with her husband and two daughters.